The Aggies played their 5th season game at home on a damp and dreary Saturday evening in College Station against the University of Houston Cougars. 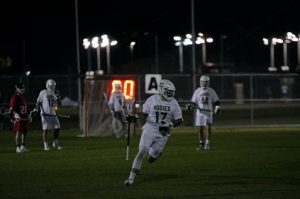 The Ags went on to defeat the Cougars 24-4 in a LSA DI South game. Aggie stats: GW Bodden (#93, Jr A TMI) 3g 3a, Ardi Elliott (#0, So A Legacy Christian Academy) 4g 1a, Auggie Buerkle (#16, Sr A Bowie) 1g 1a, Clayton Nugent (#10 So M Houston Christian) 1g, Camden Beck (#32 So M Stratford) 1g, Nick Leverich (#3 Jr A McDonough, MD) 2g 1a, Dawson Merrill (#99 Fr M Anderson) 1g 1a, Jack Watson (#22 Fr M St. Michael’s) 1g, Gavin Planeta (#2 So M The Woodlands) 1g 1a, Drew Johnson (#4 Sr Magnolia) 1g, Seth Shultze (#46 So M Houston Christian) 1g, Davis Sharp (#59 Fr M Regents) 1g, Sam Kuntz (#16 Jr M Reagan) 1g rounded out the scoring for Texas A&M. Goalie Carrson Baldwin (#34 Fr G Forest Park, VA) 1 save 4 goals against. The Ags started the game with a 10-0 run and never looked back. Univ. of Houston played hard but the A&M numbers never let them get on track. A&M played disciplined lacrosse on both offense and defense and kept the tempo fast paced causing Houston turnovers and Aggie opportunities. A&M controlled the faceoffs and played exceptionally well between the boxes. Heading east after the contest with TCU, on Sunday afternoon Feb 3rd in Dallas your Texas Aggie lacrosse team took on and defeated the SMU Mustangs 21-12. 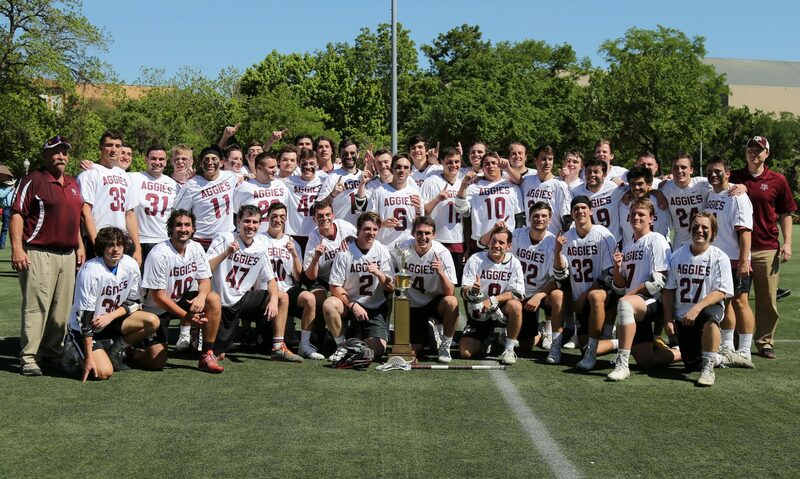 The 2018 LSA Championship rematch boasted fantastic support—SMU’s Crum Field drew a large turnout of Aggie parents, lax alumni, and fans of the game. Maybe it was the good night’s sleep, the pep talk from Coach, or both. The Ags were on fire from the opening whistle, controlling the gb’s and possession time. After grabbing the first faceoff, the maroon middies and attack used their 80 seconds and tested the Mustang defense with several dodges and shots. Hustle from the attack kept possession in a few ground ball battles, and the Aggies fought on with their remaining time. 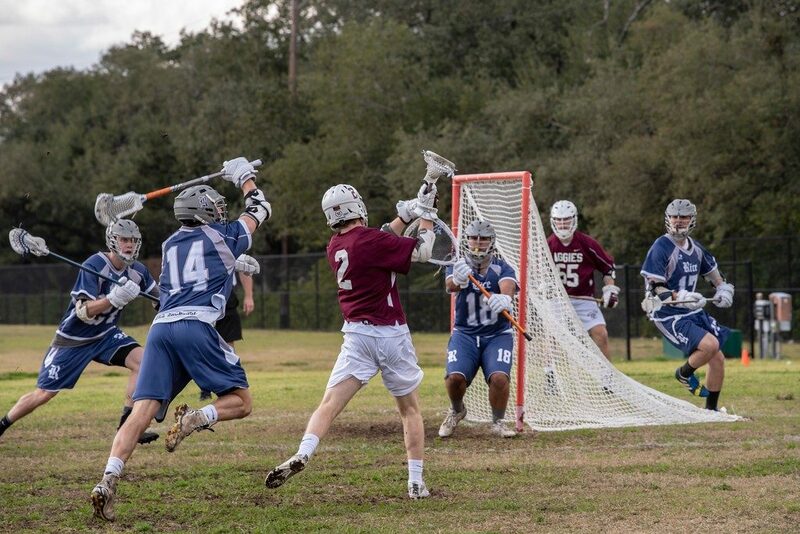 With the shot clock closing in on 0, attackman AJ Hepting (#24 Sr A Kingwood) wowed the crowd on a leap from behind the goal and across the crease to net the first goal. Riding the lefty senior Auggie Buerkle’s 3g 1a in the first quarter the Aggie run on SMU soaring to a 9-1 lead after the 1st quarter and added a 4-1 run in the second to go up 13-2 at the half. Great ball movement on offense, great attack play, and a tough defense disrupting SMU passes aided the Aggie lead. Critical saves by Robertson (#6 Jr G Dallas Jesuit) stifled any chance at an SMU answer to the Aggie offense. The Aggies however, couldn’t quite carry the same momentum through halftime. They had an emotional let down in the 3rd and allowed the Mustangs 6 goals, and only answering 2. SMU capitalized and came out of the break with a refocused transition game, creating more possessions and scoring opportunities. In the fourth A&M redeemed themselves and outscored SMU 6 – 4 to finish strong. The Aggie attack accounted for 14 goals and 6 assists, with six midfielders netted 7 goals and 4 assists for the Aggies. The Aggie scorers: GW Bodden (#93, Jr A TMI) 6g , Auggie Buerkle (#16, Sr A Bowie) 4g 2a, AJ Hepting (#24 Sr A Kingwood) 3g 2a, James McDowell (#5 Fr M The Woodlands) 3g, Chris Buell (#23 So M Highland Park) 2g 1a, Chandler Locklear (#21 Sr M Magnolia) 2g 1a, Gavin Planeta (#2 So M The Woodlands) 1g, Hunter Valk (#20 So M Cedar Park) 1g 2a, Aden Whitworth (#18 Jr DM Collingswood, Vancouver) 1g rounded out the scoring for Texas A&M. Goalie Marco Robertson (#6 Jr G Dallas Jesuit) 14 saves 10 goals against. In this 48th season of Aggie Men’s Lacrosse, A&M is now 4-0 overall. On Feb 2nd the Aggies headed up to Fort Worth, TX for a Saturday afternoon game against the TCU Horned Frogs. Still looking for that spark, the Ags struggled to find cohesive team play on either end of the field and TCU bested the Ags in the first quarter 1-2. The Aggies re-focused for the second quarter and the offense started clicking. Maroon went on a 8-3 run in the second to climb on top for good. Great ball movement on offense, tough man to man defense, and outstanding play between the boxes fueled the Aggie run up to the halftime whistle. In the second half the A&M fought against returning to 1st quarter play. Aggie shooters hit several pipes and the offense was only able to score 4 against the Frogs 5. Holding off TCU’s momentum, A&M defeated the TCU Horned Frogs 13-10 and earned a late lunch. A special thanks to Aggie parents who put together a great tailgate for the team after the game. 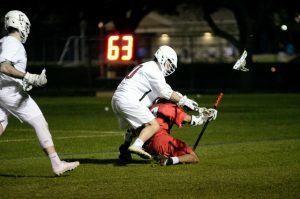 The Aggie scorers: AJ Hepting (#24 Sr A Kingwood) 2a, Chris Buell (#23 So M Highland Park) 2g 1a, GW Bodden (#93, Jr A TMI) 4g 1a, Auggie Buerkle (#16, Sr A Bowie) 4g 2a, Chandler Locklear (#21 Sr M Magnolia) 3g 1a, James McDowell(#5 Fr M The Woodlands) 1g 1a, rounded out the scoring for Texas A&M. Goalie Marco Robertson (#6 Jr G Dallas Jesuit) 14 saves 10 goals against. On Sunday afternoon Jan 27th in Houston your Texas Aggie lacrosse team took on and defeated the Rice Owls 21-11. The Ags started slowly, with Rice netting a few goals against a tentative Aggie defense. Both teams traded goals throughout the 1st and 2nd quarter, and it was only in the later of the first half where A&M began to pull away. 11 goals to Rice’s 7 at halftime. Rice played hard in the second half, but the Aggies’ numbers took their toll. Second half scoring was 10-4 in the Aggies favor and several maroon jerseys tallied points. The Aggie scorers: AJ Hepting (#24 Sr A Kingwood) 6g 1a, Chris Buell (#23 So M Highland Park) 2g, GW Bodden (#93, Jr A TMI) 1g, Ardi Elliott #0, So A Legacy Christian Academy) 3g 3a, Auggie Buerkle (#16, Sr A Bowie) 2g 2a, Clayton Nugent (#10 So M Houston Christian) 1g, Gavin Planeta (#2 So M The Woodlands) 1g 1a, Hunter Valk (#20 So M Cedar Park) 1g, Josh Fox (#8 Fr M Foothill, CA) 1g 1a, Nick Leverich (#3 Jr A McDonough, MD) 1a, Dawson Merrill (#99 Fr M Anderson) 2g, rounded out the scoring for Texas A&M. Goalies Marco Robertson (#6 Jr G Dallas Jesuit) 1 saves 3 goals against, Carrson Baldwin (#34 Fr G Forest Park, VA) 4 saves 8 goals against. The Aggies opened their 48th season at home on a brisk Saturday evening in College Station against the DBU Patriots. Like many Aggie games in the decades prior, the teams waged a battle under the glow of field lights on a grass field at Penberthy. The Ags went on to defeat the Patriots 22-2. Aggie stats: GW Bodden (#93, Jr A TMI) 5g 1a, Ardi Elliott #0, So A Legacy Christian Academy) 4g 2a, Auggie Buerkle (#16, Sr A Bowie) 3g 1a, Chris Buell (#23 So M Highland Park) 1g, AJ Hepting (#24 Sr A Kingwood) 1g 3a, Reed Cameron (#40 Fr A Austin High) 1g 1a, Clayton Nugent (#10 So M Houston Christian) 1g, Josh Fox (#8 Fr M Foothill, CA) 1g, Camden Beck (#32 So M Stratford), Nick Leverich (#3 Jr A McDonough, MD) 1g, Dawson Merrill (#99 Fr M Anderson) 2g, rounded out the scoring for Texas A&M. Goalies Marco Robertson (#6 Jr G Dallas Jesuit) 0 saves 0 goals against, Carrson Baldwin (#34 Fr G Forest Park, VA) 3 saves 2 goals against. The Ags started the game with a 9-0 run in the first quarter and never looked back. Dallas Baptist was well drilled and disciplined and this game provided both squads with much needed live game playing time to sharpen their skills for their 2019 campaigns. Both teams were tested by the newly implemented 80-second shot clock and the Aggies would like to thank the Doc Hall Foundation for the generous donation of timing hardware.